Eternal Orthodox Church calendar for the 24.02 year 2017. Born in Cappadocia, Blaise was meek and God-fearing from early childhood. 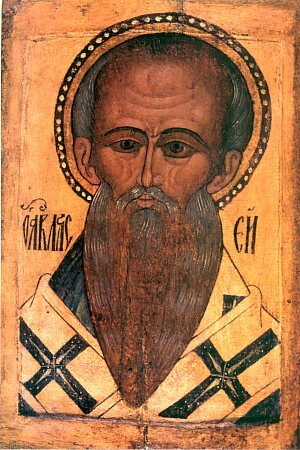 He was chosen for his virtues as bishop of Sebaste, and was a great spiritual and moral light in that pagan town. During a period of violent persecution of Christians, Blaise encouraged his flock and visited the martyrs in prison, among whom was the famous Eustratius. When the city of Sebaste was left entirely denuded of Christians - some killed and others fled - Blaise, by then an old man, retired to the mountain of Argeos and lived there in a cave. Ferocious wild beasts, recognising a holy man, came to him and he gently tamed them. But the persecutors found the saint in that hidden spot and took him for trial. On the way there, Blaise healed a boy who had a bone stuck in his throat and, at the petition of a poor widow, made the wolf that had taken her pig return it to her. The benighted judges tortured him, flogging him terribly. By his steadfastness in the Christian faith, Blaise brought many unbelievers to the Faith. Seven women and two children were thrown into prison with him; the women were slain first, then Blaise and the two children. He suffered and was glorified in 316. Blaise's prayers are sought for the health and well-being of domestic animals and for protection from wild beasts. In the West, he is also invoked against sore throats. Saint Demetrius of Priluki, Wonderworker, was born into a rich merchant’s family in Pereyaslavl-Zalessk. From his youth the saint was uncommonly handsome. Receiving monastic tonsure at one of the Pereyaslavl monasteries, the saint later founded the St Nicholas cenobitic monastery on the Sts Boris and Gleb Hill at the shore of Lake Plescheevo near the city, and became its igumen. In 1334 St Demetrius first met with St Sergius of Radonezh, who had come to Pereyaslavl to see Metropolitan Athanasius. From that time, he frequently conversed with St Sergius and became close with him. The fame of the Pereyaslavl igumen was so widespread that he became godfather to the children of Great Prince Demetrius Ioannovich. Under the influence of the Radonezh wonderworker, St Demetrius decided to withdraw to a remote place, and went north with his disciple Pachomius. In the Vologda forests, at the River Velika, near the Avnezh settlement, they built a church of the Resurrection of Christ and they prepared to lay the foundations for a monastery. The local inhabitants were fearful that if a monastery were built there, their village would become monastery property. They demanded that the monks leave their territory, and wishing to be a burden to no one, they moved farther away. Not far from Vologda, at the bend of a river in an isolated spot, St Demetrius decided to form the first of the cenobitic monasteries of the Russian North. The people of Vologda and the surrounding gladly consented to help the saint. The owners of the land intended for the monastery, Elias and Isidore, even trampled down a grain field, so that a temple might be built immediately. In 1371 the wooden Savior cathedral was built, and brethren began to gather. Many disciples of the monk came there from Pereyaslavl. St Demetrius combined prayer and strict asceticism with kindliness. He fed the poor and hungry, he took in strangers, he conversed with those in need of consolation, and he gave counsel. He loved to pray in solitude. His Lenten food consisted of prosphora with warm water. Even on feastdays, he would not partake of the wine and fish permitted by the Rule. Both winter and summer he wore an old sheepskin coat, and even in his old age he went with the brethren on common tasks. The saint accepted contributions to the monastery cautiously, so that the welfare of the monastery would not be detrimental to those living nearby. The Lord granted His servant the gift of clairvoyance, and he attained a high degree of spiritual perfection. St Demetrius died at an advanced age on February 11, 1392. The brethren approaching found him as though asleep, and his cell was filled with a wondrous fragrance. Miracles from the relics of St Demetrius began in the year 1409, and during the fifteenth century his veneration spread throughout all Rus. And no later than the year 1440, the Priluki monk Macarius recorded his Life (Great Reading Menaion, February 11) based on the narratives of St Demetrius’s disciple Igumen Pachomius. Holy Prince Vsevolod of Pskov, in Baptism Gabriel, a grandson of Vladimir Monomakh, was born at Novgorod, where in the years 1088-1093 and 1095-1117 his father ruled as prince. His father was the holy prince St Mstislav-Theodore the Great (April 15). In the year 1117, when Great Prince Vladimir Monomakh gave Mstislav Kievan Belgorod as his “udel” (land-holding), practically making him co-ruler, young Vsevolod remained as his father’s vicar in the Novgorod principality. Holy Prince Vsevolod did much good for Novgorod. 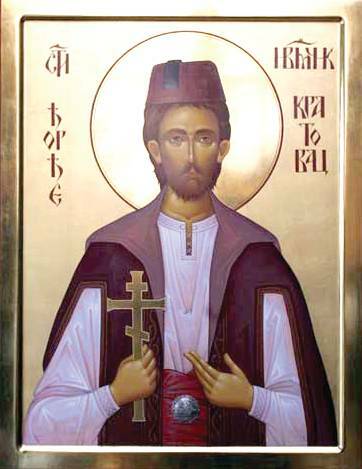 Together with the Archbishop of Novgorod, St Niphon (April 8), he raised up many churches, among which were the cathedral of the Great Martyr George at the Yuriev monastery, and the church of St John the Forerunner at Opokakh, built in honor of the “angel” (i.e. 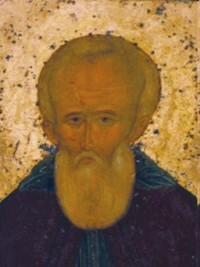 patron saint) of his first-born son John, who had died in infancy (+ 1128). In his Ustav (Law code) the prince granted a special charter of lands and privileges to the cathedral of Holy Wisdom (Hagia Sophia) and other churches. During a terrible famine, he exhausted his entire treasury to save people from perishing. Prince Vsevolod was a valiant warrior, he marched victoriously against the Yam and Chud peoples, but he never took up the sword for lucre or power. In 1132, upon the death of holy Great Prince Mstislav, Vsevolod’s uncle Prince Yaropolk of Kiev fulfilled the last wishes of his brother and transferred Vsevolod to Pereyaslavl, then regarded as the eldest city after Kiev itself. But the younger sons of Monomakh, Yuri Dolgoruky and Andrew Dobry, were apprehensive lest Yaropolk make Vsevolod his successor at Kiev, and so they marched out against their nephew. Hoping to avoid internecine strife, St Vsevolod returned to Novgorod, but was received there with disaffection. The Novgorodians felt that the prince had been “raised” by them and should not have left them earlier. “Vsevolod went to Rus, to Pereslavl,” noted the Novgorod chronicler, “and kissed the cross against the Novgorodians, saying, ‘I will kill you.’” Striving to restore good relations with Novgorod, the prince undertook a victorious campaign against the Chud people in 1133, and he annexed Yuriev to the Novgorod domain. But a harsh winter campaign in 1135-1136 against Suzdal was unsuccessful. The stubborn people of Novgorod would not heed their chastisement by God, and they could not forgive the prince for their defeat. The assembly decided to summon a prince from the hostile Monomakh line of the Olgovichi, and they condemned St Vsevolod to banishment. “You suffered exile at the hands of your own people,” we sing in the troparion to the saint. For a month and a half they held the prince and his family under guard at the archbishop’s palace. When Prince Svyatoslav Olgovich arrived on July 15, 1136, Vsevolod was released from his captivity. 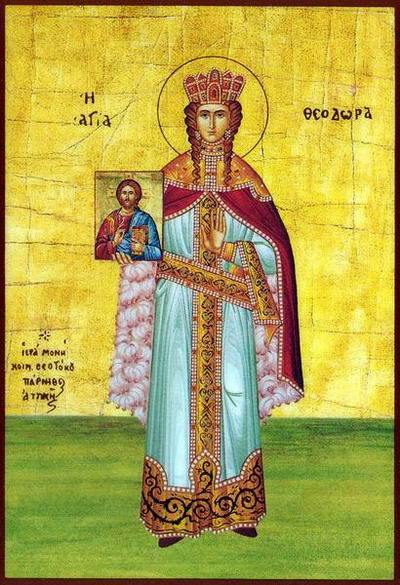 Vsevolod went again to Kiev, and his uncle Yaropolk gave him the Vyshgorod district near Kiev, the place where St Olga (July 11) had lived in the tenth century during the rule of her son Svyatoslav, “preferring the cities of Kiev and Pskov.” St Olga came to the defense of her descendant in 1137 when the people of Pskov, recalling the campaigns of the Novgorod-Pskov army led by the prince, invited him to the Pskov principality, the native region of St Olga. He was the first Pskov prince, chosen by the will of the Pskov people. Among the glorious works of St Vsevolod-Gabriel at Pskov was the construction of the first stone church dedicated to the Life-Creating Trinity, replacing a wooden church from the time of St Olga. 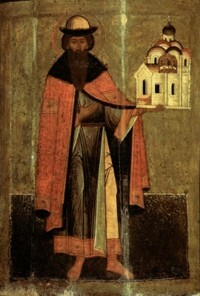 On the icons of the saint, he is often depicted holding the church of the Holy Trinity. St Vsevolod ruled as prince at Pskov for only a year. He died on February 11, 1138 at the age of forty-six. All of Pskov gathered at the funeral of the beloved prince, and the chanting of the choir could scarcely be heard over the people’s wailing. The people of Novgorod sent an archpriest from the Sophia cathedral to take his holy relics back to Novgorod. The prince, however, did not want his body to rest in Novgorod. He would not allow Novgorod to be deprived of his relics by the people of Pskov, who had driven him out, and the coffin would not move from the spot. The Novgorod people wept bitterly and repented in their misfortune. Then they asked to be given just a small piece of his relics “for the protection of their city.” Through their prayers a fingernail fell from the saint’s hand. The Pskov people put St Vsevolod into the temple of the holy Great Martyr Demetrius. Beside the grave they placed the military armaments of the prince, a shield and sword, in the shape of a cross, with the Latin inscription, “I will yield my honor to no one.” On November 27, 1192, the relics of holy Prince Vsevolod were uncovered and transferred into the Trinity cathedral, in which a chapel was consecrated in his honor. The deep spiritual bond of the city of St Olga with the holy Prince Vsevolod was never broken. He always remained a Pskov wonderworker. At the siege of Pskov by Stephen Bathory in 1581, when the walls of the fortress were already breached and the Poles were ready to rush into the city, they brought the holy relics of Prince Vsevolod from the Trinity cathedral to the place of battle, and the enemy withdrew. On April 22, 1834, on the first day of Pascha, the saint’s holy relics were solemnly transferred to a new shrine in the main church of the cathedral. At the appearance of the wonderworking Pskov-Protection Icon (October 1), holy Prince Vsevolod-Gabriel stood among the heavenly defenders of Pskov.